This beautiful wooden bird table provides your garden birds with the perfect safe and sheltered spot to rest and feed at a height of 1.5 metres, whilst also contributing to your gardens natural look. 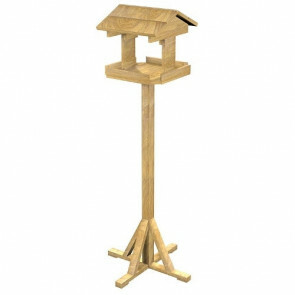 This classically designed bird table has been constructed from FSC certified Fully treated redwood and sturdy and robust feeding table. It is easy to assemble with a pitched roof to provide protection to your feeding garden visitors (from the elements such as rain, snow and predators) and a stand with 4 legs for extra stability.